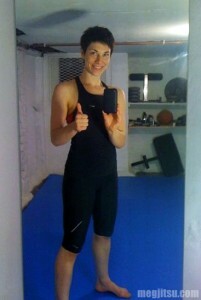 Thumbs up for home mats! I matted half of my basement, last weekend, with 40mm jigsaw mats from Cannons UK Flooring; it is now an absolutely superb training space! One of the best purchases I’ve made in a long while, and I would highly recommend these mats to fellow grapplers. Cannons UK offers very high quality mats at a fraction of the price charged by other online retailers (between £50 and £150 less than other suppliers for my 12 square meters). I was somewhat put off by the website, which is, shall we say, less than polished with some slightly eccentric behaviours, however I was convinced they were legit when I rang to see about placing an order. The customer service was friendly, professional and efficient, not to mention delivery was only £10 and they delivered next day. Well above par from what I could tell from competitors’ sites. The mats are reversible (red or blue) and come in two finishes; I chose tatami. All mats come fully surrounded by edging squares. The mats arrived in perfect condition and were very easy to lay. The jigsaw edges fit snugly and as you would expect. It took 20 minutes or so to trim the included edging squares to fit around the outside; this was very straight-forward and there’s so much surplus edging that it is possible to have several attempts at any trimming jobs that aren’t up to standard. While I am hoping to roll on these babies this week, I have so far used them for Pilates, stretching, partnerless BJJ-drills, sprawls and calisthenics. While I was at first concerned that the finish was a mite too slick, in fact it has a nice level of grip so that there’s no mat burn, but enough friction to not go sliding wildly when in Yoga postures or moving across the mats in elbow-to-knee. The 40mm thickness is a dream. The mats are laid on concrete, but the exceptional EVA foam core means it is entirely comfortable to sprawl as hard as you like, break fall and so on. Mats are a pretty major purchase and I had tried to win some, with readers’ kind support, in BView’s 99% off contest; I came second place, but by this point was totally fired up to make it happen. I hunted around online for weeks comparing prices and Cannons UK was by far the best priced and I can affirm the high quality of the mats. Having a home matted area has been a goal for some time and I am really pleased with the end result. oooo i wish i could mat out a room looks really good. You doing the Bristol open? It is marvellous, Rachel, so glad I was able to make it happen. No can do any competition. Knee is still rubbish and goes hay wire every time I attempt to go from standing. December will be a year of recovery, s perhaps can push after than point. How about you? Training up for more comps? Thanks meg, you have saved me the stress, will contact them, looking to buy around 100 for our New club, Happy rolling.